Kaycan is a market leader because of their passion for quality, which delivers exceptional value to their customers. The standards of excellence that distinguish Kaycan products include superior performance, outstanding beauty, durability and low maintenance. 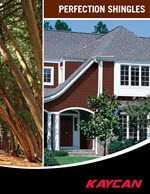 Timberlake siding offers the subtle, realistic wood grain texture of carfully painted wood and the easy maintenance of vinyl to deliver a beautful long lasting home exterior. 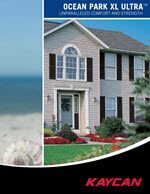 Unparalleled Comfort and Strength is when the thickest panel on the market is joined with precisely contoured insulation to produce the Ocean Park XL ULTRA™ Insulated Wall System. Ocean Park XL ULTRA™ panels are 43% thicker than conventional panels and deliver long lasting performance. Matched with perfectly profiled backer board, your home will be covered with a beautiful, sturdy wall system that will add comfort and energy savings to your home. Kaycan Startrer Trims are the best chice for securing the first course of siding panels to the home. 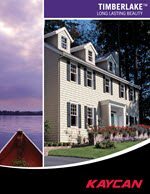 Kaycan's variety of J, H, Vertical Base, Undersill and J Trims provide the prefect finishing trouch to your design. 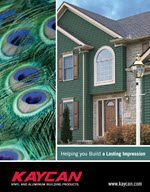 Exterior Building Products to Meet All Your Needs The natural look of painted wood. 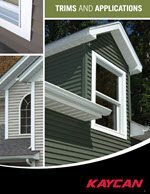 A wide range of siding profiles and accessories. Available in an array of warm earth tones and modern, vibrant colors.